There is a book in the current 150th anniversary exhibition in the library with an intriguing bookplate in it. “This book was borrowed from the institution library and was carried by Colonel A.R. Mias OBE, TD (Fellow), when he landed at Le Hamel on the beaches of Normandy at 7:00 hours on “D” Day, 6th June 1944. The book itself “Land and Marine surveying in reference to the preparation of plans for roads and railways; canals, rivers, towns’ water supplies; docks and harbours; with description and use of surveying instruments” by W. Davis Haskoll is a good early text book on the topic published in 1868 but is not that rare or exciting. 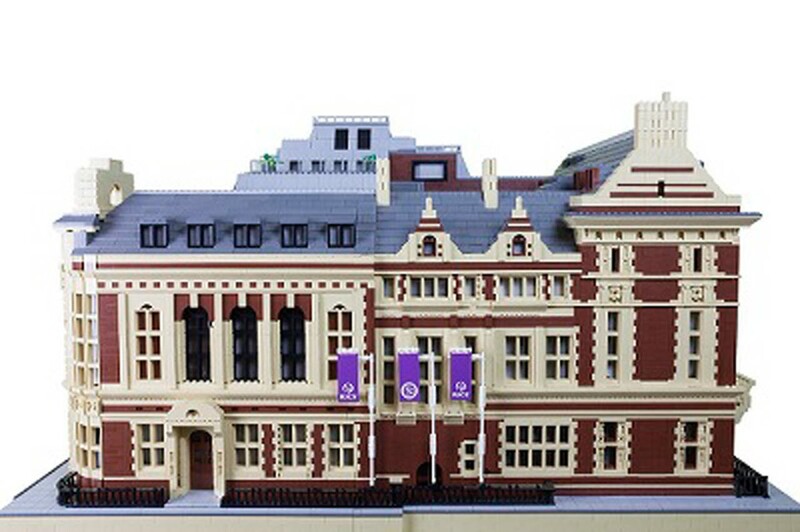 Its value to the RICS lies in the bookplate. Alan Raymond Mais, was an RICS member, listed in the 1938-39 membership list as an Associate living in Craigmore, Downsway, Sanderstead. He had his own construction consultancy firm. By 1946-47 he was a Fellow living at 48 Kensington Court, Kensington. In the meantime, following time spent in the special forces in France, Iran and Iraq on the outbreak of war, in late 1943 he become involved in building the pierheads and floating roadways for the Mulberry Harbours under Colonel S.K. Gilbert of the Royal Engineers. The Mulberry Harbours were temporary portable harbours developed to facilitate the rapid offloading of cargo onto the beaches. They were floated across the English Channel in over 400 pieces and reassembled on the French coast. 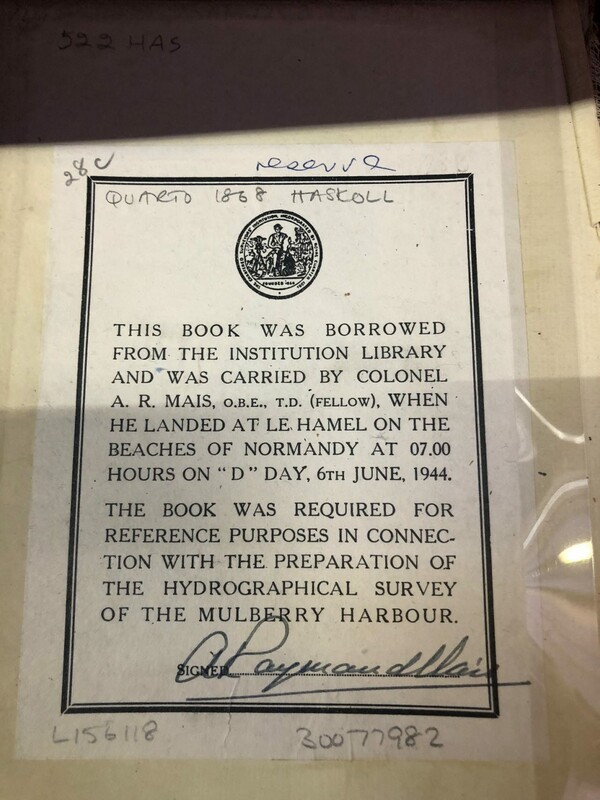 Initially there were two harbours, Mulberry A at Omaha Beach for the Americans and Mulberry B for the British at Gold beach which included Le Hamel. Mulberry A was destroyed in a storm on 10 June 1944 but Mulberry B continued to be used for 10 months following the landings and became known as Port Winston. It is not clear how Mais used this book. In the lead up to D-Day there had been detailed information gathered on the geology and hydrography, measurement and description of the physical features of the sea, of the coast of France. However, he may have used the book to assess how the harbour would operate once it got to France and this may be why he took it with him. I’m sure not many soldiers were calling 75-year-old books with them when they landed on the beaches! In the immediate aftermath of D-Day Major Mais, as he was then, joined the Canadians in their advance on the Rhine, was promoted to Colonel and became the deputy chief engineer in Antwerp. Following the war he joined contractors Trollope and Colls, becoming joint managing director and chairman in 1963 and retiring in 1968 when the firm was taken over by Trafalgar House. He was made a Life Peer in 1967 and sat in the House of Lords on the Labour, Liberal and Liberal Democrat benches as Lord Mais of Walbrook. In 1972 he was made Lord Mayor of London, the first peer to be elected to that office. He died in 1993, aged 82. The book is a little battered but shows no sign of water damage. We don’t know when he returned it to the library but I am sure we waived any fines! What a lovely idea to have added this bookplate to elevate a rather ordinary object to an important part of our historic collection.